What are the School Safety, Visitor and Volunteer Sign-In Procedures? We love to have parents and volunteers come help during the school day. If you have not had a chance to connect with your child's teacher about opportunities to help, please feel free to do so anytime. When visitors and volunteers do come to the school, we ask that you follow our safety rules about checking in the office. During the school day, 8:00am-3:05pm, all visitors and volunteers must check in the school office first. All visitors and volunteers will be given a name sticker that they need to visibly wear while they are in the building. When you leave the building, visitors and volunteers must sign out in the office.Please let us know if you have any questions about this process or school safety concerns. Are there school fees?Yes, elementary (Kindergarten through Grade 5) school fees are $10.00. 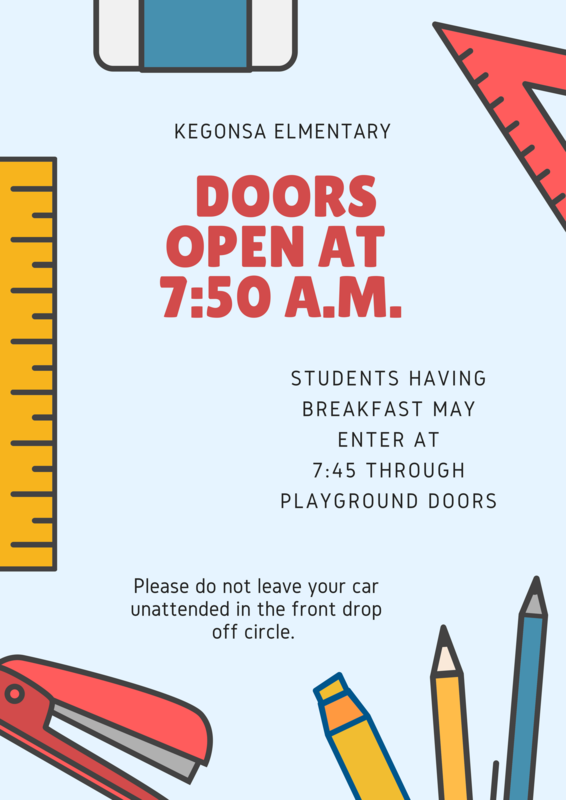 What are the Kegonsa Elementary School office hours? What are the Kegonsa Elementary School Phone numbers? Kegonsa Elementary School Attendance/Absence line: 608-877-5200, press "1"
In the event that a student absence is necessary, parents/guardians must contact the school before 8:20 am the day of the absence or send a note in advance of the absences to excuse the absence. To leave an absence message please call 608-877-5200 and listen for the attendance line prompt. Give your child's name, date of absence, and reason for the absence. When a student is absent and the parent/guardian has not contacted the school, an automated message will be sent to your designated contact advising of the absence. What do I do when I need to pick up my child before the end of the school day? When a student leaves school between the hours of 8:00 am and 3:05 pm, the parents/guardians/other designee must come to the office and sign the child out of school. The student Sign-out sheet is located in the office. School personnel will call the student to the office. What do I do if I want to volunteer at the school? Is there a parent group at Kegonsa? Working for Kids is a great organization that does a lot to support learning and the school environment. From volunteering, to classroom supplies, to playground equipment, it is a dedicated group for the betterment of our learning community. All parents and guardians are welcome to find out more about this group by attending their meetings the second Tuesday of every month, at 6:15 pm in the Kegonsa School Library. Daycare is provided during the meeting. Where can I park when I pick up, drop off, or visit the school? Parents may park on Vernon Street, Chalet Drive or curbside in the east parking lot, but not in front of the school on Vernon Street. There is no stopping, standing, drop off or pick up on Vernon Street in front of the school during school days. Families may also use the east circle driveway nearest the main entrance to pick up or drop off students. We request that you do not leave your vehicle unattended. When using the east parking lot or parking lot circle, please make sure that you pull ahead to make room for others and safely pass on the left. When students exit the vehicle, please have them get out on the curbside only for safety. The west circle driveway, near the kindergarten, First and Second Grade wing, is off limits to any family or staff member vehicle during, before, and after the school day to provide a safe location for our buses to deliver and pick up our children. If I need to write a check for fees, field trips or lunch, who do I make the check out to? Please make checks payable to: "Stoughton Area School District." How will I know when school is closed due to the weather or other emergency? If school will be closed or delayed due to inclement weather or other emergencies, Madison radio stations WTDY (1480), WTSO (1070), and WIBA (1310); FM stations WIBE (101.5), WMGN (98), WJJO (94.1), WZEE (104.1), WMLI (96.3), WMAD (92.1); and WISC-TV Channel 3, WMTV Channel 15, and WKOW Channel 27 will begin broadcasting any school closing or delay at 6:30 am and continue periodically until about 8 am. A school closure message will also be sent via School Messenger to the phone number designated at registration. The Stoughton Area School District contracts with "TAHER" to provide breakfast, lunch and morning and lunch milk for students. 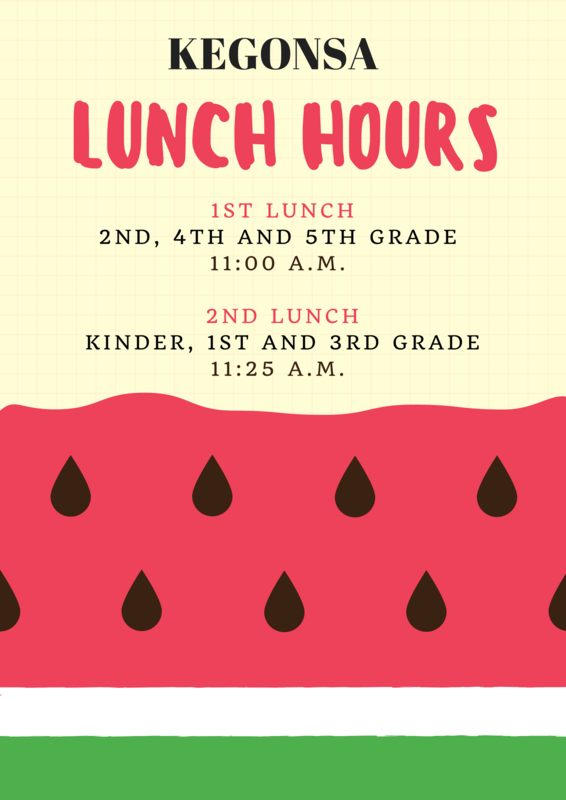 Students may elect to take either a hot lunch, which includes a milk, or cold lunch from home, and may purchase a milk for lunch. They also provide morning milk-break milk for students that elect to take it. All prices for lunches and milk are provided on the Stoughton Area School District webpage at www.stoughton.k12.wi.us. You may send your child's milk, lunch or breakfast payments to Kegonsa School and deposit it in the TAHER deposit box located directly across from the Kegonsa Office. Please label the envelope with your child's name and what the payment is for. Make all checks out to "Stoughton Area School District."